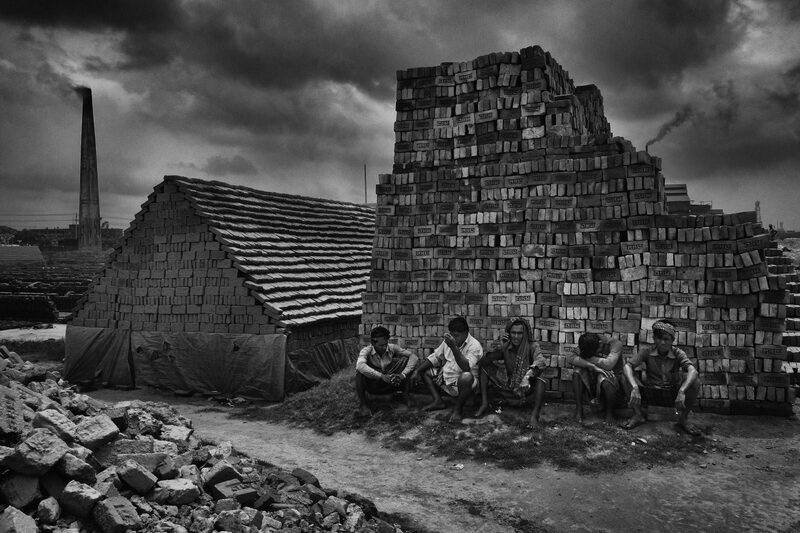 Twenty kilometers east of Dacca, the periphery reveals many brick factories where men, women and very often children work in difficult and dangerous conditions. 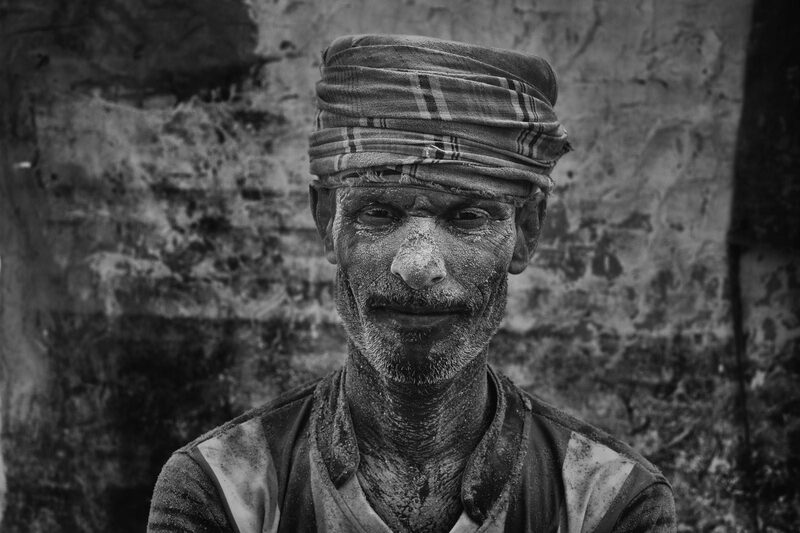 In this industrial complex, men prepare the earth using a mold to make bricks of gray color. After drying in the sun, they will go into a giant oven; a sort of long tunnel similar to those of coal mines. 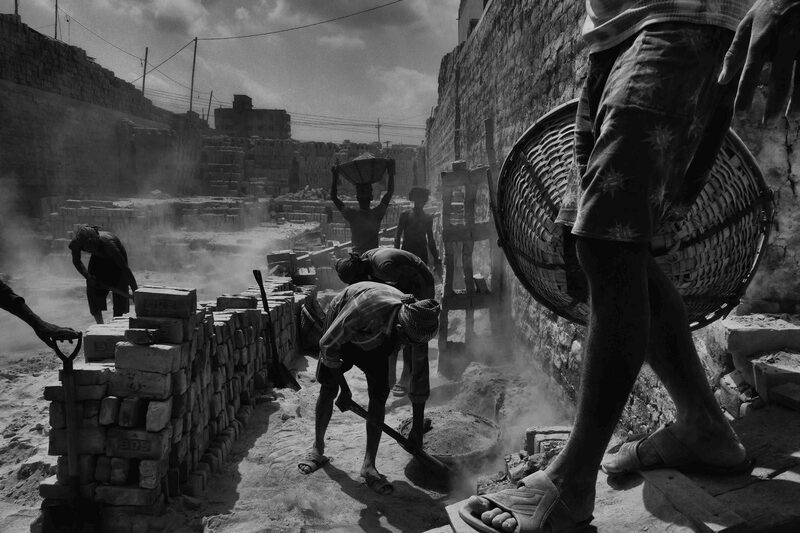 Overwhelmed with dust, in an infernal heat, women and children carry the bricks outside in wheelbarrows. 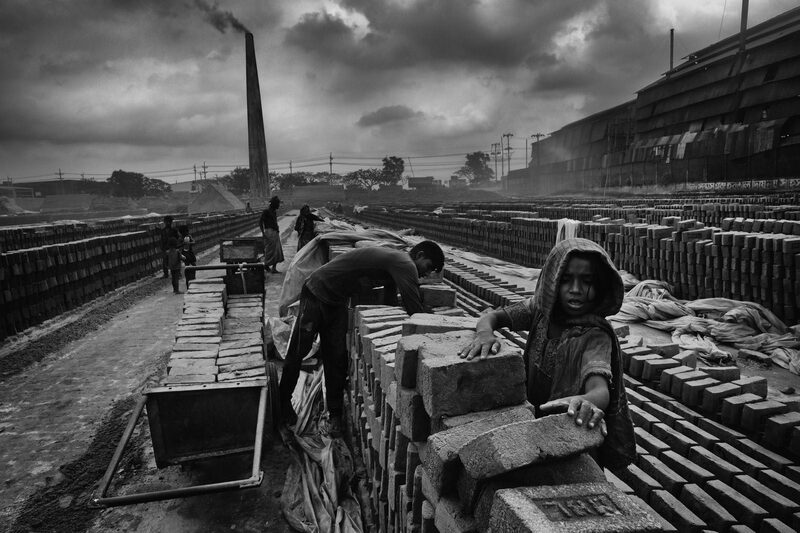 With about 11,000 brickworks across the country, Bangladesh is struggling to meet the construction demands of a rapidly growing population. 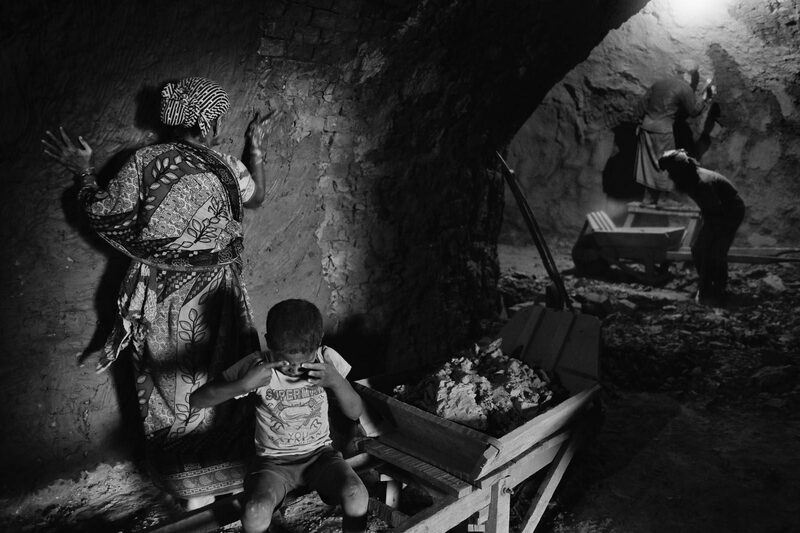 Armies of workers including women and children suffer the hard manual labor, in extremely poor conditions, for merely $1 per day. Working 12-18 hours, without access to fresh water or decent food, children as young as 4 contribute to the monumental task of producing 1500 bricks per person per day. 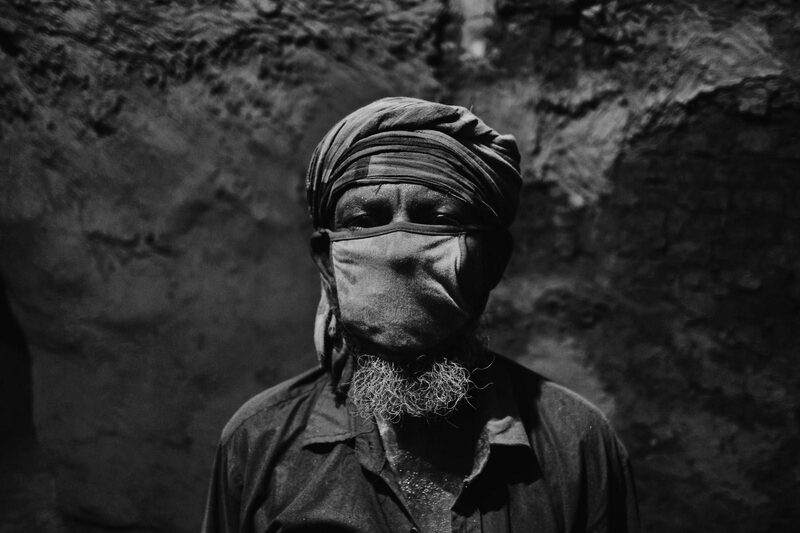 Families live in makeshift camps near the factories breathing air filled with arsenic and particles of burnt plastic. Despite the 2011 directives from the OECD and the UN, holding multinationals accountable for workers rights and good labor practices all along the manufacturing chain, the reality on the ground is rather substandard. 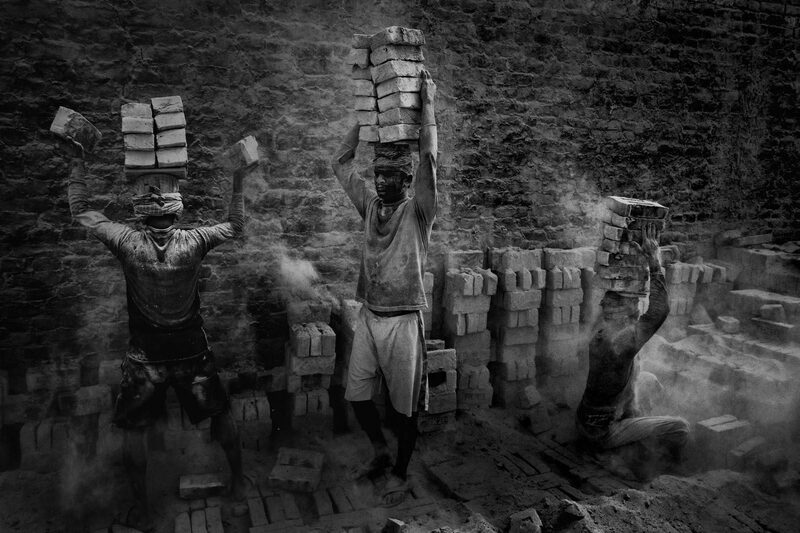 Several associations have launched campaigns under the name “Blood Bricks”, to heighten awareness around what is essentially a form of slave labor. Particularly active in India, unions, ONGs and other human rights organizations are staging events to inform local populations and mobilize workers in order to improve working conditions, increase pay rates and above all, eliminate child labor which leaves kids uneducated, exploited and trapped in poverty. Men carry the fired bricks. They store them in piles several meters high, ready to be loaded onto trucks. The technique of collecting bricks is well established. 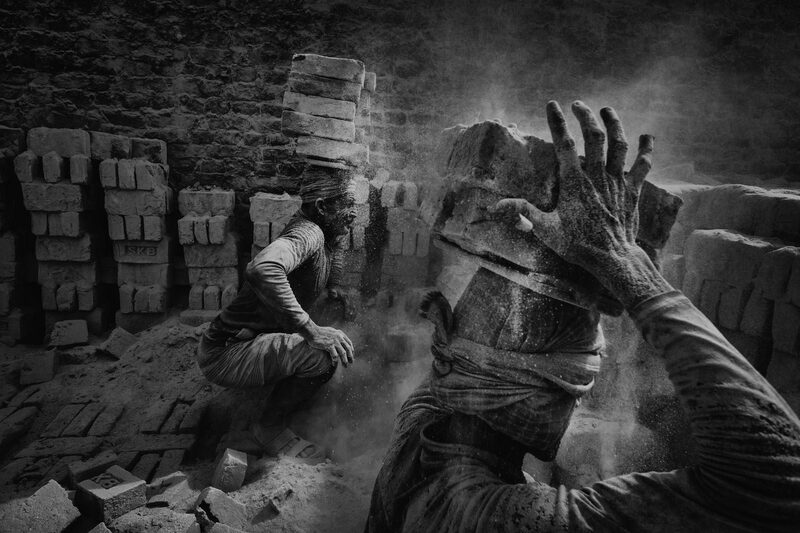 The men crouch down and using both hands, simultaneously place two bricks on a flat piece of wood resting on their head. But every movement stirs up a fine cloud of dust that covers them completely as it settles, transforming them into earth statues and endangering their health. Women carry unfired bricks of greenish-gray earth tones. For each trip they receive a small piece of wood to be exchanged at the end of the day for the equivalent of $1 or $2 dollars. It is inside these hot tunnels that the bricks are fired. A woman cleans the walls of the oven in the oppressive heat and ubiquitous dust. 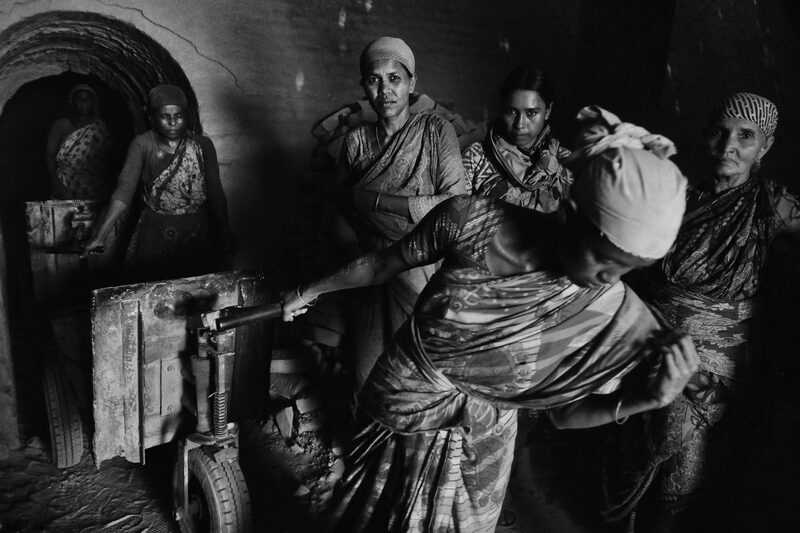 It is mainly women’s work to bring the raw bricks into the ovens. They are often accompanied by their children. A boy rubs his eyes against the irritating air and sweltering heat. In the oven a man is wearing a mask. Few people wear them despite the dangers of toxic fumes. It is inside these hot tunnels that the bricks are fired. 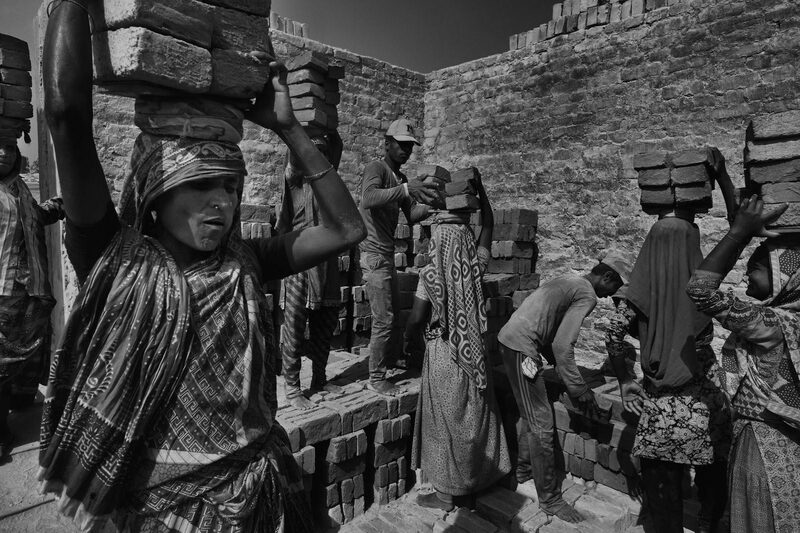 It is mainly women’s work to bring the raw bricks into the ovens. Men rest in the shade of a pile of fired bricks. On the left, raw bricks stacked ironically in the form of a house await firing. 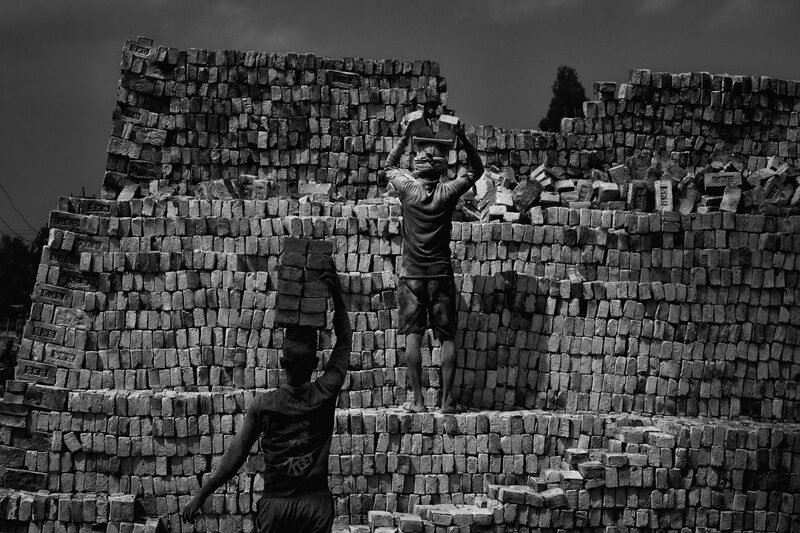 A young boy struggles to maintain his balance under a heavy load of bricks. The earth, extracted from the surrounding area, is kneaded before being put into a mold. The bricks dry in the sun before the firing process. 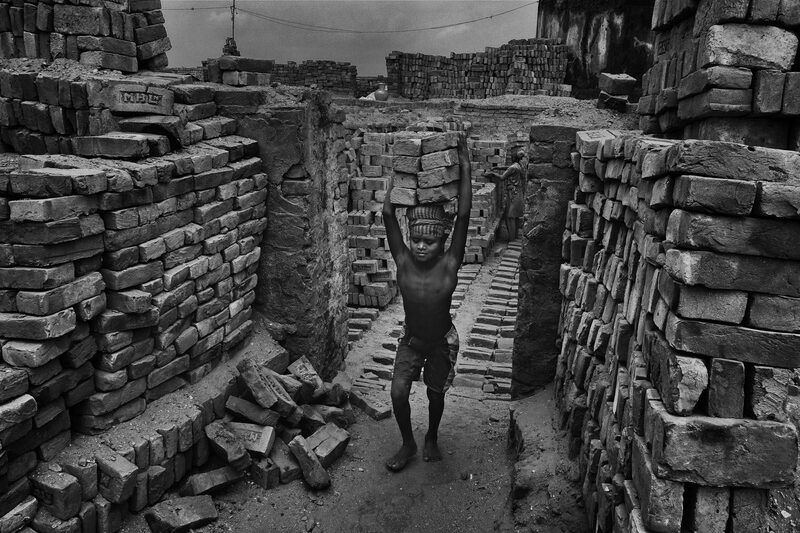 Many children work at this stage of manufacturing, some knead the earth, others carry bricks before storing them in the sun. The atmosphere next to the factory is smoky.